Android has become the first preference for maximum smartphone users because it is open source. Consequently, it comes with lots of possibilities that are continuously revealing. 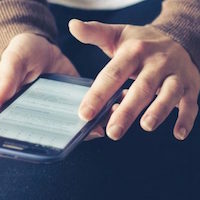 Play store is its official platform to install countless mobile applications and there is also an option to ad third-party apps in .APK format without requiring any kind of unlocking. For playing videos, you will find some applications with very cool features. Due to the continuous improvement in UX and UI, now advanced features have been added that enables the user to play every kind of video file format in desired resolution. Below is a list of some the coolest video player for Android phone. 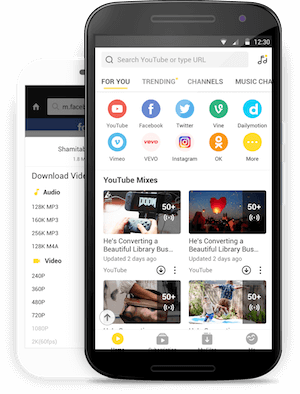 While talking about top video player for Android of current times, the name of Snaptube application comes on top position. It is a multipurpose app that enables the users to play all available offline multimedia contents whether it is video or audio. This is not just an offline video player but you can access all video streaming sites through Snaptupe. It is a highly customisable app where you can place the bookmarks of your favourite sites and gain access with just one tap. While playing any online video, one can take control over its resolution and also play the video file in mp3 format. In the above search bar, you just need to enter the keyword related to video and it will appear on your screen instantly. This is a free music and video application for Android devices that has amazing features for playing online and offline videos and songs. Lark Player is completely free of cost and doesn’t require any premium charge for revealing the full features like other apps. It has a beautiful interface which is lightweight as well as very fast for playing media files. Lark Player basically uses YouTube for providing you latest as well as old songs in the best possible bitrate. 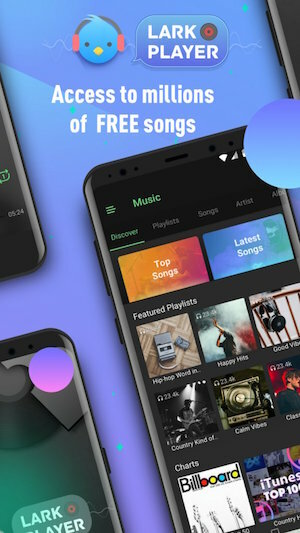 The discover section of this app contains a completely different world of music which is classified n genres like rock, indie pop, classical, jazz and all regional languages. You can also change the themes according to the mood which is available in the settings section. Either enter a keyword in the search box or choose the soundtracks from your playlist. If you are looking for the most powerful Android video player then install MX player instantly. It is capable of playing a maximum number of file formats as compared to any other competitor. It comes with the feature of hardware acceleration that works with its inbuilt HW+ mode. The MX player is capable of multicore decoding and also avail pinch zoom in zoom out option for users. With gestures of scrolling, you can take control over its playback features like forwarding, backward, next and previous. To keep it safe from kids, there is a parental control option to block calling features and prevent other apps from opening. In the list of unique video player app for Android, KM player has a distinct status. It was initially designed for desktops and has compatibility with all desktops. Now Pandora.TV has launched it on play store. This Android streaming video player supports every kind of videos at highest possible resolution. For the convenience of global users, you will find a total number of 30 languages. The floating screen enables you to multitask while watching the video. Its playback option supports the feature of slow down and speed up for watching a video clip in detail. Currently, the developers are presenting it in three variants i.e. mirror mode, pro and VR. As a regular computer user, the name of VLC must be familiar to you. VLC is one of the open source and most successful video players for PC. Now its developers are presenting it at Android platform with same powerful features. It is compatible with maximum discs, devices and network streaming protocols available on internet. You can use it for playing audio as well as video files at with complete controls. Just like the PC version, the Android app is also equipped with equalizers and filters for playing al audio formats. Auto rotation, gesture control and aspect-ratio adjustment are some of the essential controls that you can expect in VLC player. 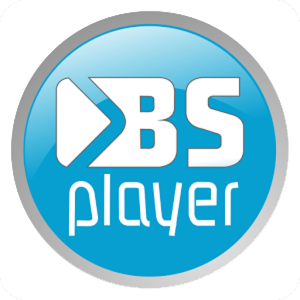 BS Player is meant for those who want complete technical control over their video player. It is hardware accelerated video player that use maximum performance of processor to play heavy video files. With multi-core decoding support, it significantly improves the playback speed and fluency. Along with videos, it also supports audio files and that too when you minimise the app in background. While accelerating the speed to playback, it also prevents over-consumption of battery. After connecting it with the internet, BS player automatically finds subtitles and play them along with video. It also supports direct video payback with the help of an OTG cable or uncompressed .RAR file format. It is one of the simplest and most convenient video players available at Android platform. Just like VLC, it was also firstly available on PC. Later, the company has launched it for Android platform. 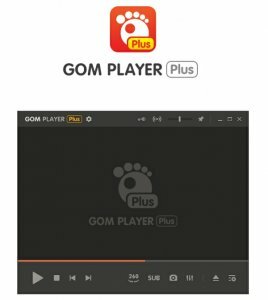 The GOM player supports every kind of non-encoded video files along with subtitle management. The speed control, finger gestures and light control are some of its basic functions which are quite impressive. It has a friendly user interface that enables you to play 360-degree videos at highest possible resolution. Along with video player, you can also try its audio player, memory storage saver and LAN remote control apps.